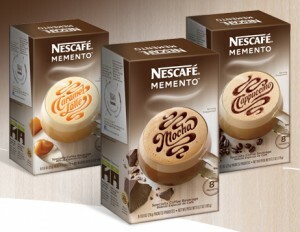 Get a FREE sample of Nescafe Memento Coffee. All you have to do is go to the website & fill out your mailing information. Your sample should be sent within 4-6 weeks. Enjoy coffeehouse flavor in an instant with new NESCAFÉ® MEMENTO™. Available in three flavors, this expertly crafted coffee beverage will leave your taste buds begging for more. Try it for free and discover what WOW tastes like. Thank you Pam Crouse for letting us know this is still available – we love this freebie! 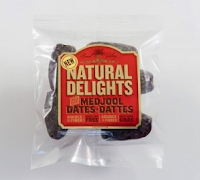 Ger Free Sample Medjool Dates.Grab a free sample just for liking the Medjool Dates Facebook page. All you have to do is "like" their facebook page and fill out your information! Grab not only a free sample for you, but a free sample for friends! These are a nice healthy snack that are just slightly sweet! You can even use them in baking! 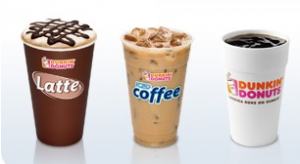 Get Free Medium Beverage from Dunkin Donuts when you join their Dunkin Perks Reward Program. Get FREE sample of Xorknob Cookie. Enter your information and they will send you a bag of cookie chunks, and they’ll try to include at least one whole Xorknob. Although Xorknob is not yet available at Trader Joe's or Target, you can taste him with a free sample. Xorknob's current production runs are small, but we always have a few extras. 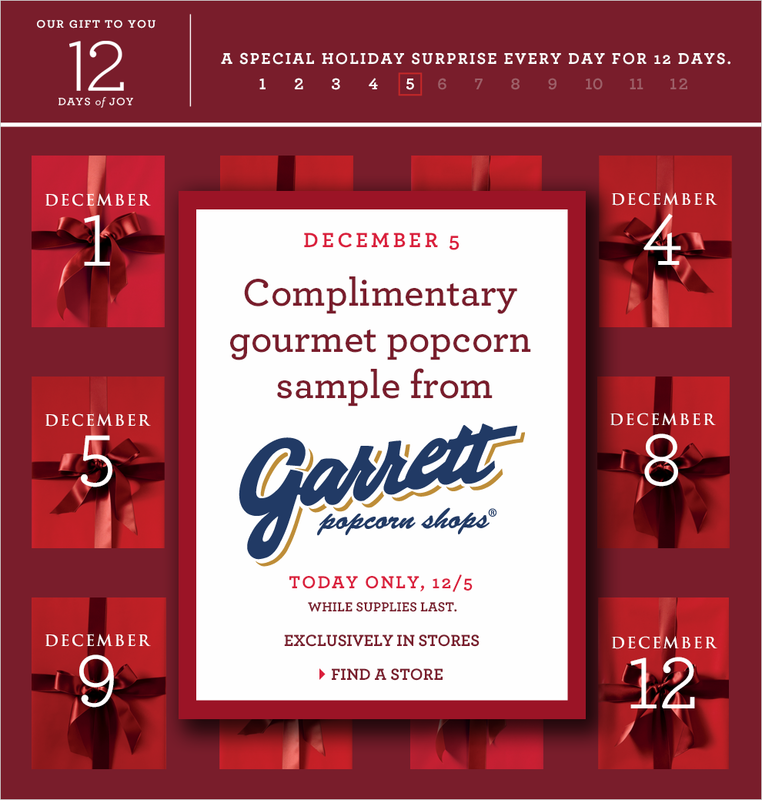 Get a Free Complimentry Popcorn Sample From Garrets. 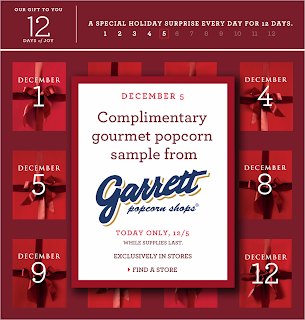 Visit any of their participating locations and ask for their Banana Republic Popcorn Special. This freebie will be available while the supplies last and will be available only today - 12/5/2012. Here is where you can find some local stores so that you can enjoy this awesome freebie. Get a Free Jim Burger for Jim's, James, Jamie etc. Valid only at participating U.S. restaurants. Offer valid for one free Sweet Jim Beam® Bacon Swiss Burger on 12/4/12 only, Dine In only, for Guests 18 years or older, with a valid ID showing proof of their name or address. Burgers are served a la carte; fries, drink and tip are not included. Offer is good for all Guests with the first name of Jim and the derivative of it: James, Jamie, Jaime, Jaimie, Jami, Jamey, Jameson, Jimmy, Jimi, Jim, and Jimbo; and for anyone who lives on Jim Street or on any street that includes a variation of Jim in the street name. Be a part of the Kerrygold The Kids Ate Their Homework Sweepstakes. If you go to the Kerrygold Facebook fan page and like them, you will have the chance to win a 12-month supply of Kerrygold Cheese and Butter. There will be five people who will be able to win the free cheese and butter and there will be 450 of you who will win a Free Kerrygold Cheese or Butter, awarded in the form of a coupon which is only valid for one Kerrygold Cheese or Butter. 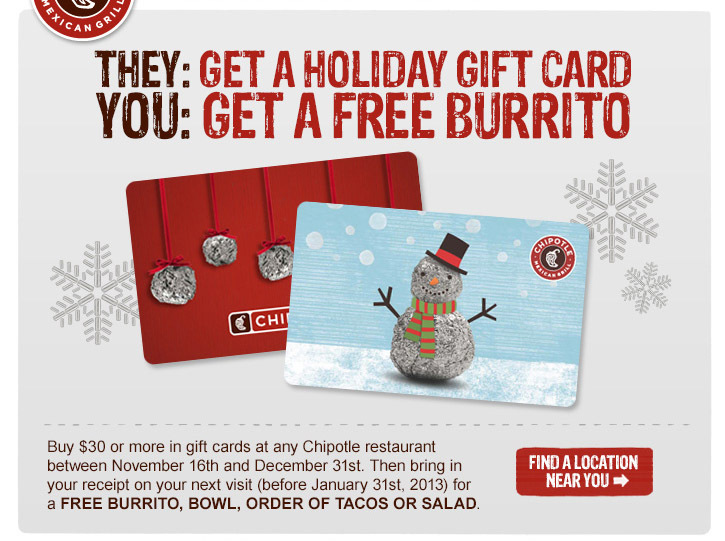 You can enter this once unfortunately until December 07, 2012. 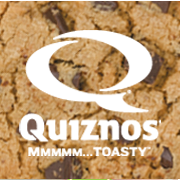 Get a FREE Oven Toasted Cookie from Quiznos (12/4 Only). Visit your local Quiznos to snag a free Oven Toasted Cookie with purchase! Keep in mind that not all stores are participating in this freebie giveaway and the free cookie is only available in the participating locations. The link we have provided will take you to their Store locator website and not to a list of the participating locations, so make sure you call ahead of time and check with your location and see if they are participating. 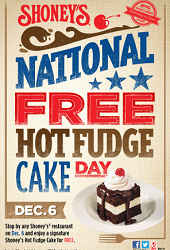 Get a FREE Hot Fudge Cake at Shoney’s on December 6th! Buy $30 or more in gift cards at any Chipotle Restaurant between November 16th and December 31st. Then bring in your receipt on your next visit (before January 31st) for your free burrito, bowl, order of tacos or salad. 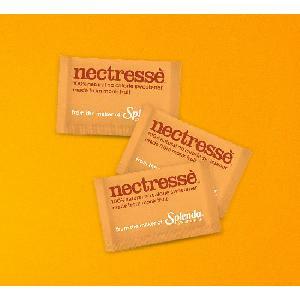 Get a FREE Splenda Nectresse No Calorie Sweetener Sample Pack! Limit 2 entries per person, your request for a free sample will be processed upon providing the required information. If you previously missed this freebie, make sure you take advantage of it today while it is still available. Get FREE Marathon Pasta sample. 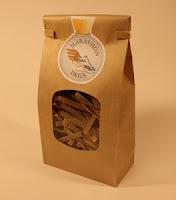 To receive a completely FREE 4 oz sample of their batch-made, boutique pasta, please tell them a little about yourself. As soon as they receive your information, they will follow up with a confirmation e-mail and send out your FREE 4 oz Marathon Pasta! Click HERE to know more about the company and their products. 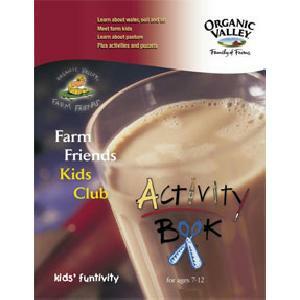 Get FREE Organic Valley Farm Friends Welcome Kit. Fill out the short form to receive. Organic Valley is offering a free welcome kit that contains the Kids' Activity Flyer and coupons. 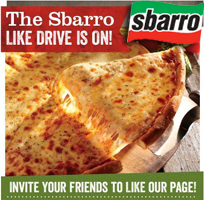 Get a FREE Slice of Sbarro Pizza. Simply sign up and you'll be able to get the offer, and you'll get more restaurant savings throughout the year. 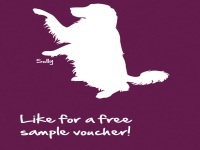 Get Free Pet Food Sample from Honest Kitchen . Make sure to "like" Honest Kitchen and you can receive a free sample voucher to go into your local Honest Kitchen and receive a free sample. 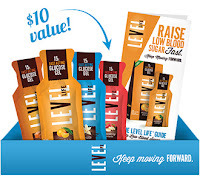 Get Free Toddler Snack Pack. Just head over and "Like" the Ella's Kitchen page and be one of the first 3,000 to sign up at the start time to snag your free pack! mOmma & Ella's Kitchen are teaming up for a Gift-A-Thon! Today at 2pm EST 1pm CST, 12pm MST, 11am PST they will be giving away 3,000 toddler snack packs. Each toddler snack pack includes: 1 mOmma Soft Spoon and 1 Ella's Kitchen Pouch. Get a FREE 20oz Bottle of Evamor Water! This is from Evamor Facebook page.They also have a BOGO FREE Evamor Water Coupon. This offer is now valid until December 31st, 2012. Get FREE Level Foods Starter Kit with 4 FREE Level Life Glucose Gels. All you need to do is fill out the form in 3 quick steps to receive your free kit. 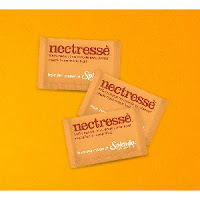 Get your Free 2 Sachets of Calovia Sweetener. All you need to do is complete the form to request for 2 sachets of Calovia Sweetener. At the moment, this FREE sample offer is only valid within the USA and Canada. 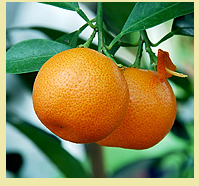 Calovia is an all natural stevia sweetener that can be used by health conscious people, diabetics and weight watchers. It can be used in coffee, fruit drinks, food or any other consumable products. It is the perfect substitute for sugar. It has Zero Calories and yet it tastes great! Get Free Stride ID Gum at Quick Chek. All you need to do is "Like" Quick Chek on Facebook. 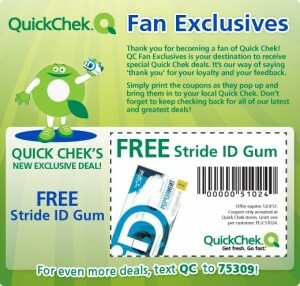 Click on "Weekly Fan Coupon" tab and redeem the voucher good for a free Stride ID Gum at QuickChek.